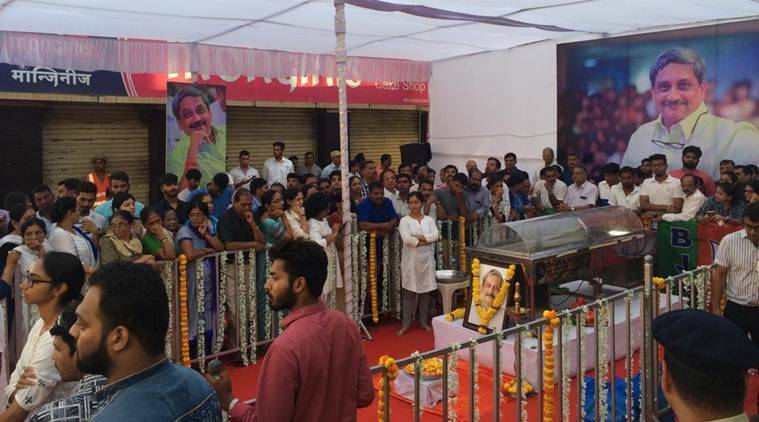 Goa CM Manohar Parrikar funeral highlights: Four-time Goa chief minister Manohar Parrikar was laid to rest at Miramar Beach on Monday next to the memorial of the state’s first CM Dayanand Bandodkar. Manohar Parrikar was accorded state funeral with full military honours at Miramar. Meanwhile, BJP and its allies in Goa are yet to come up with a name for the next chief minister of the state. Union Minister Nitin Gadkari said while the Goa unit of BJP had decided who should be the next chief minister, the issue was only with alliance partners. Speaker Pramod Sawant and BJP leader Vishwajit Rane are the CM post frontrunners. 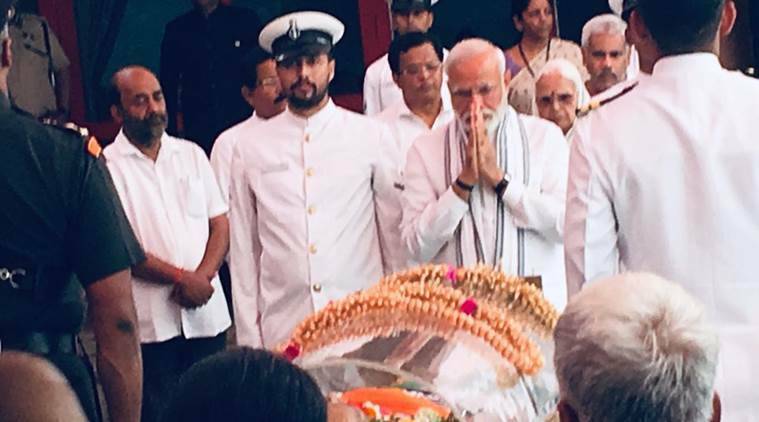 Earlier, Prime Minister Narendra Modi and other Central ministers reached Goa to pay their last tributes to former Goa chief minister Manohar Parrikar. The Congress, meanwhile, reached Governor Mridula Sinha staking claim to the government. All the 14 Congress MLAs, led by Leader of the Opposition Chandrakant Kavlekar, handed over a letter to Sinha, saying it was the single largest party in the Assembly and should be allowed to form the government. 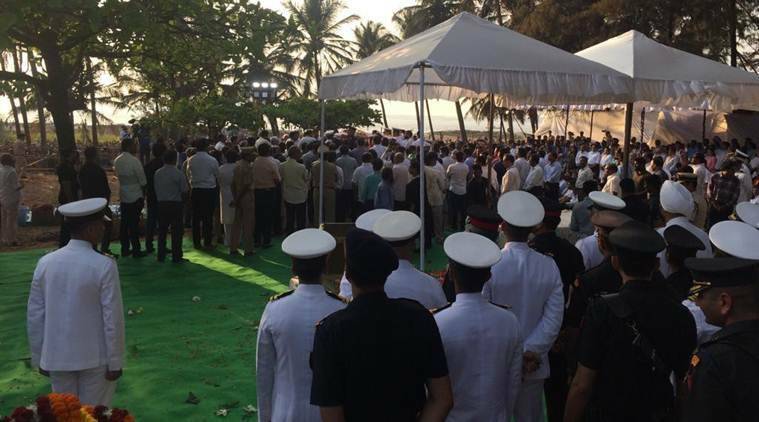 Four-time chief minister of Goa and former Union Defence Minister Manohar Parrikar has been laid to rest at Miramar beach next to the memorial of the state's first CM Dayanand Bandodkar. Manohar Parrikar was accorded state funeral with full military honours at Miramar. 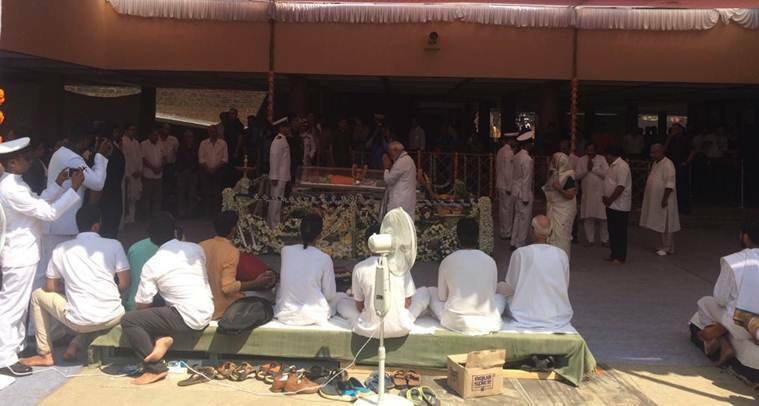 The final rites of Manohar Parrikar are being performed in Miramar Beach in Goa in the presence of family members, top leaders and thousands of followers. Parrikar is being accorded a state funeral. Among the leaders lined up to place wreaths on Parrikar are Vijai Sardesai, Congress leader Girish Chodonkar, MPs Narendra Sawaikar and Shripad Naik, Ramdas Athawale, Suresh Prabhu, NSA Ajit Doval and BJP chief Amit Shah. 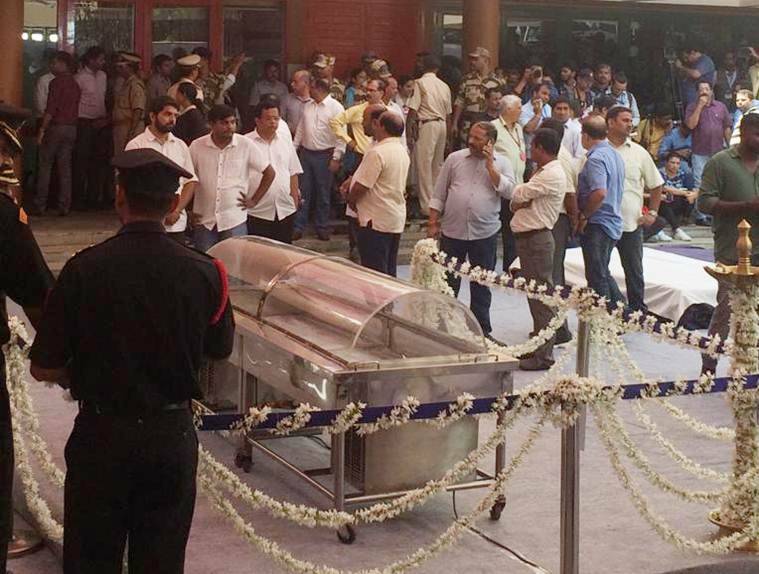 Former Goa chief minister Manohar Parrikar's mortal remains have reached Miramar beach. Last rites are currently taking place in presence of family and top BJP leaders, including BJP chief Amit Shah, and thousands of followers. Goa Cabinet ministers lay wreath on Manohar Parrikar. Union Minister Nitin Gadkari, who held a round of talks with BJP leaders and alliance partner Maharashtrawadi Gomantak Party (MGP) to discuss Manohar Parrikar’s successor in Goa, said the party was decided on their candidate for the next CM. "I am in Goa till 6 pm and it would be better if we zero down to the consensus before that. BJP Goa has decided who should be their leader, the issue is only with alliance partners," says Gadkari. Thousands of people from various walks of life have joined the funeral procession of Manohar Parrikar. His last rites will be performed at Miramar beach shortly. BJP president Amit Shah and several chief ministers of BJP-ruled states have arrived at Miramar. Amid speculation that Goa Assembly Speaker Pramod Sawant will be declared the new chief minister, party workers from Sanquelim constituency have already reached the Raj Bhawan. Sawant is a two-time MLA from Sanquelim. Sawant is known to be from the cadre and is seen as someone who had “ear of the chief minister”. A four-time chief minister, Manohar Parrikar enjoyed widespread popularity across Goa. The affection he enjoyed from ordinary Goans was on display as hundreds of common folks, and his party workers lined up to pay tribute to Manohar Parrikar. 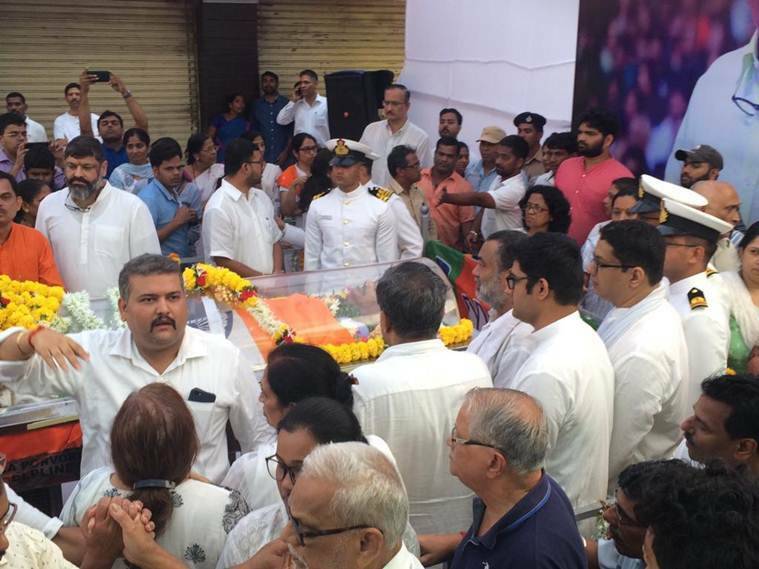 The area around the BJP office was packed with people who arrived there to pay tributes to Parrikar before his final journey. The funeral procession of Manohar Parrikar to Miramar has started. 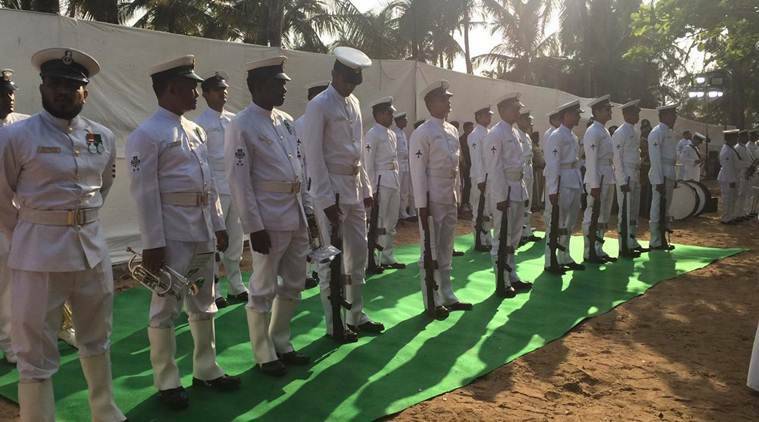 The final rites of Parrikar will be performed at 5 pm at the Miramar beach next to the memorial of Goa’s first chief minister Dayanand Bandodkar. Manohar Parrikar, 63, will be accorded state funeral with full military honours at Miramar. The Haryana government on Monday declared a one-day state mourning as a mark of respect for Manohar Parrikar. "The state government has decided to observe a one-day state mourning as a mark of respect to the departed dignitary. The national flag will fly at half-mast on March 18," an order issued by Haryana Chief Secretary's office said. Meanwhile, Prime Minister Narendra Modi has left Goa after paying tribute to Manohar Parrikar. BJP chief Amit Shah has arrived at the Goa airport and is headed for the funeral site. 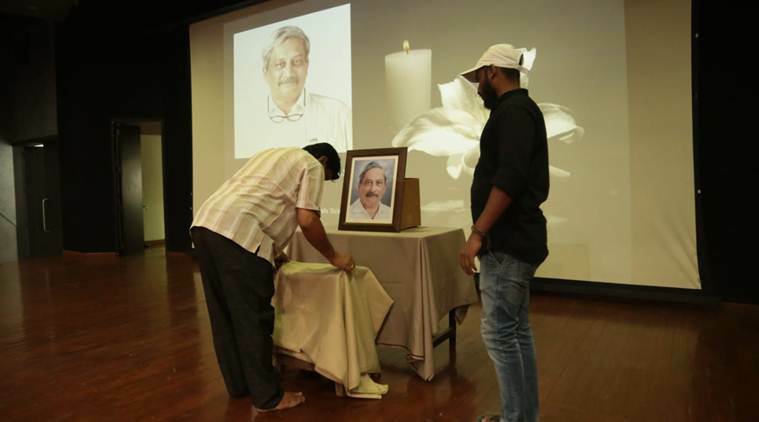 The Goa Forward Party, an alliance partner in the state's BJP-led government, Monday said a stalemate persisted on the selection of the next chief minister following the death of Manohar Parrikar, PTI reported. The GFP and Maharashtrawadi Gomantak Party's three MLAs each, an equal number of Independents, and BJP legislators have been meeting since late Sunday night to reach a consensus on Parrikar's successor. "The stalemate over the issue (next CM) continues," GFP chief Vijai Sardesai said. He said he, along with other coalition partners, had raised certain apprehensions with Gadkari but was yet to get answers on them from the BJP. Thousands of citizens and party workers of the BJP arrived at Kala Academy in Panjim to pay their final tributes to Parrikar. A six-time MLA representing the state capital, Parrikar never lost an election in his constituency. During his first term as chief minister in the early 2000s, Parrikar focussed on developing infrastructure in the city keeping in mind internation events that he later introduced to the state. Goa Assembly to be put in suspended animation? The battle over who will be the next chief minister of the state continues even as Raj Bhawan gears up for a swearing in ceremony. While BJP Goa chief Vinay Tendulkar claims all is well with the allies - MGP and GFP - the allies say there is no consensus on a CM candidate and any such talk was premature. Sources in the BJP have said that Nitin Gadkari gave the allies a clear choice - either agree to a CM candidate from the BJP or face President's Rule. We will have to wait and watch what happens next. Congress president Rahul Gandhi and Congress party leaders observed a two-minute silence at a public rally in Karnataka's Kalaburagi, to pay last respects to Goa Chief Minister Manohar Parrikar who passed away Sunday night. Union Ministers Suresh Prabhu and Smriti Irani also arrived at Kala Academy, to pay their final tributes to Parrikar. The two arrived soon after Prime Minister Narendra Modi. PM Modi, Nirmala Sitharaman have arrived in Goa. They will shortly reach Kala Academy to pay homage to Goa CM Manohar Parrikar. The main area has been cordoned off. The Maharashtrawadi Gomantak Party (MGP), an ally of the ruling BJP in Goa, said its executive committee would take a call on whether to continue support to the state government. MGP leaders met Nitin Gadkari for the second time to discuss succession plans in the state. MGP leader Sudin Dhavalikar had yesterday expressed his wish to become the next chief minister of Goa. Today, however, he rejected the idea that he was in the race for the top post. "The MGP would hold its executive committee meeting later in the day to decide whether to continue its support to the BJP-led government or not," he told PTI. As per sources, when asked if the new CM will be declared at 3 pm, Dhavalikar said that no name has been finalised. 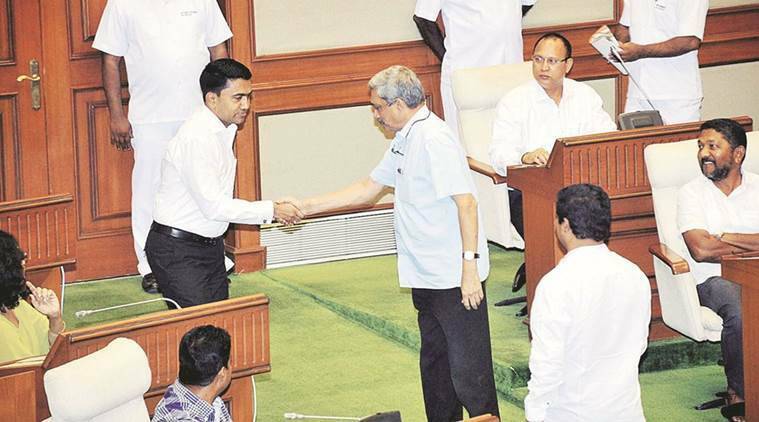 Speaker Pramod Sawant and Health Minister Vishwajit Rane have emerged as frontrunners for Goa CM’s post. PTI reports that the BJP will decide on a name by 2 pm and the swearing-in is likely after 3 pm. 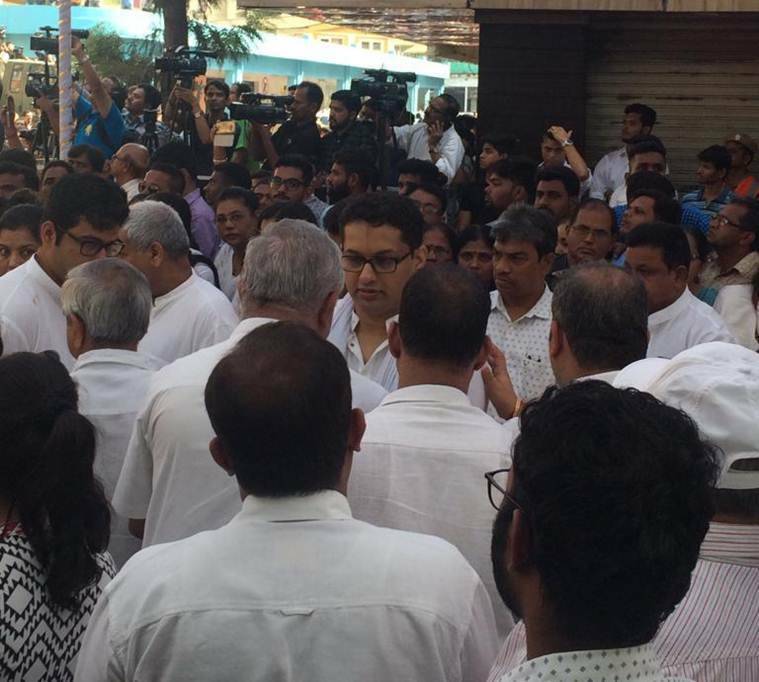 Even as the hunt for new CM continues in Goa, a delegation of Congress has reached the Raj Bhavan to stake claim to the government, the third time in three days. Claiming that the Congress is the "single-largest party" in Goa, the party asked Governor Mridula Sinha to "dismiss the ruling BJP." "We do not have an appointment, because she is refusing to give us time. But despite that, we have arrived here to meet the Governor to stake our claim. It is our right as a single largest party in the Goa assembly," Goa Congress chief Chandrakant Kavlekar said. Manohar Parrikar's mortal remains have now reached Kala Academy, around three km from the BJP office. The general public will be allowed to pay their tribute to him. Priests have started chanting hymns. Also heard in the background is the devotional song - “Hare Rama Hare Krishna” The police have also put up temple style barricades near the area in order to control the crowd. As per a report in PTI, BJP MLA Vishwajit Rane, MGP leader Sudin Dhavalikar, who are aspirants for the chief minister's post, attended the meeting. A third contender, Pramod Sawant, who is currently the speaker, was not present. Leaders of the GFP were not called for the meeting. Dhavalikar said clarity on the leadership issue was expected by 3 pm. Manohar Parrikar's death has triggered a political tussle in Goa. Both the BJP (the ruling govt) and the Congress (single largest party) are keen to form the government in the state. Union minister Nitin Gadkari, who held an overnight meeting with BJP MLAs and alliance leaders, has begun the round two of talks, reported news agency PTI. Gadkari is currently talking with BJP MLAs and MGP leaders to select new Goa chief minister. The overnight meeting concluded in a deadlock after the leaders could not reach a consensus. Union Cabinet, chaired by PM Modi, today condoled the passing away of Manohar Parrikar. After observing two minutes of silence, the Cabinet approved one-day national mourning across the country in the memory of the leader. The resolution passed by the Cabinet read, "In his passing away, the country has lost a veteran and distinguished leader, affectionately called as the Chief Minister of commoners. Shri Parrikar will be remembered for his simplicity and his abilities as an exceptional administrator. His contribution to the building of modern Goa and to the modernization of India's Armed Forces as well as improvement to the lives of ex.-Servicemen will never be forgotten. The Cabinet extends its heartfelt condolences to the bereaved family and the people of Goa on behalf of the Government and the entire nation." Manohar Parrikar's teacher Suresh Amonkar, a cancer survivor himself reached BJP office to pay tribute to the departed soul. "He is a young boy to me. I am 84 he is 63. I too went through 20 chemos and a cancer survivor. He was my most brilliant student. He always kept touch and enquired. Since last year he was not accessible. I feel sad today," he added. 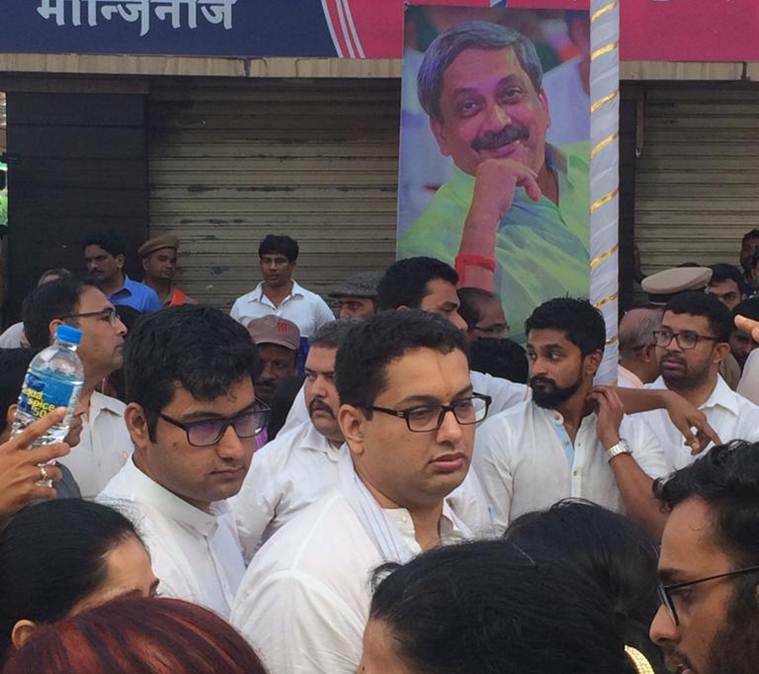 Thousands of people thronged the streets of Goa to catch a final glimpse of CM Manohar Parrikar. His body is kept at the BJP headquarters in Goa, from where it would be taken to Kala Academy, to allow the public pay their tribute to him. 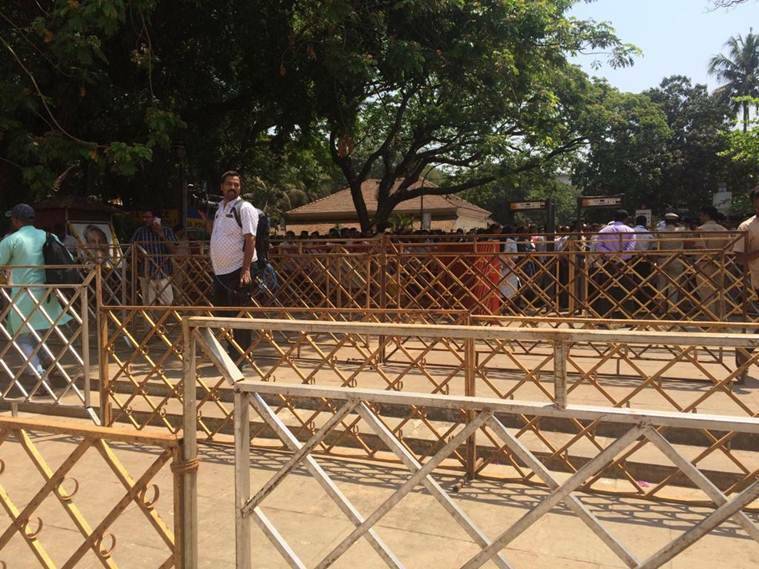 Crowd swells at the BJP headquarters where the mortal remains of Manohar Parrikar have been kept. The Indian Institute of Technology Bombay (IIT-B) will hold condolence meet on Monday evening to pay tribute to their alumnus, Goa chief minister Manohar Parrikar, who died after a long illness. 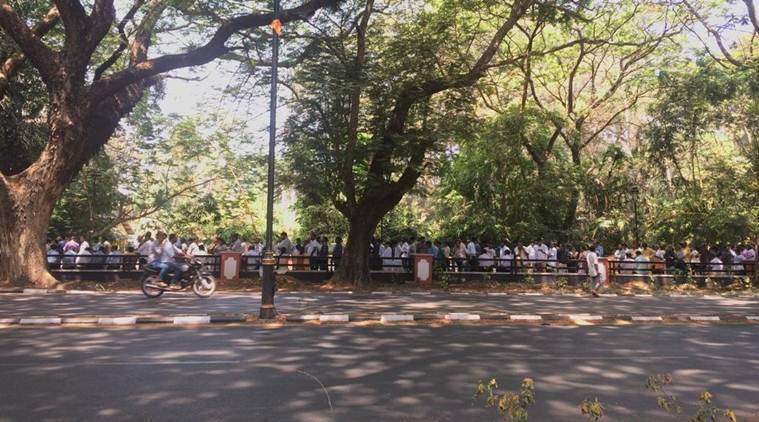 The meeting will be held at 5 pm at the institute's P C Saxena auditorium here, an IIT-B spokesperson said. In 2017, he addressed the 55th convocation of the Mumbai-based institute where he told the graduates to take up jobs in social and development sectors. An alumnus of the famed institute, he also asked students to join politics and the Army, said a former IIT-B student who was present at the convocation ceremony. "Why can't IIT graduates, who have had the best engineering education in the country, take up academics and run some of these colleges, and transform their quality?" Parrikar had then said. PM Modi will be among the BJP leaders who will pay their last respects to the former defence minister today. Modi will be leaving for Delhi shortly. Manohar Parrikar's sons - Utpal Parrikar (front) and Abhijat Parrikar (at back) - seen at the BJP headquarters in Panjim. Parrikar is survived by two sons and their families. Manohar Parrikar who died after a prolonged illness will be accorded a state funeral today. 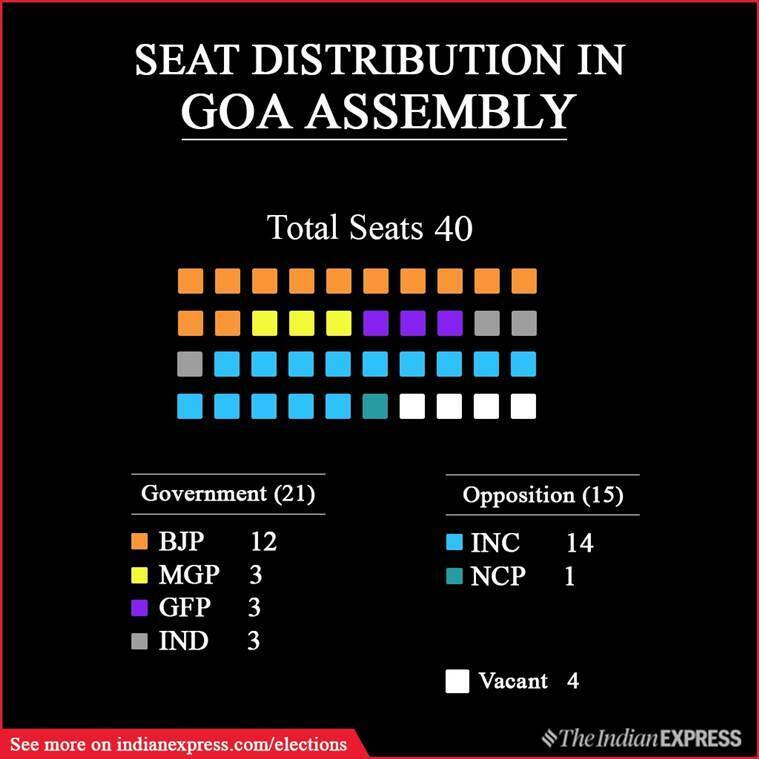 Who are the front runners for the Goa CM post? From BJP’s side — the MLAs are looking at two candidates — Speaker Pramod Sawant and Health Minister Vishwajit Rane. While Sawant is known to be from the cadre and having seen as someone who had “ear of the chief minister”, and someone who was groomed by Parrikar himself, Rane is winning round one, after reports emerged that he has the support of Goa Forward and independent MLAs. 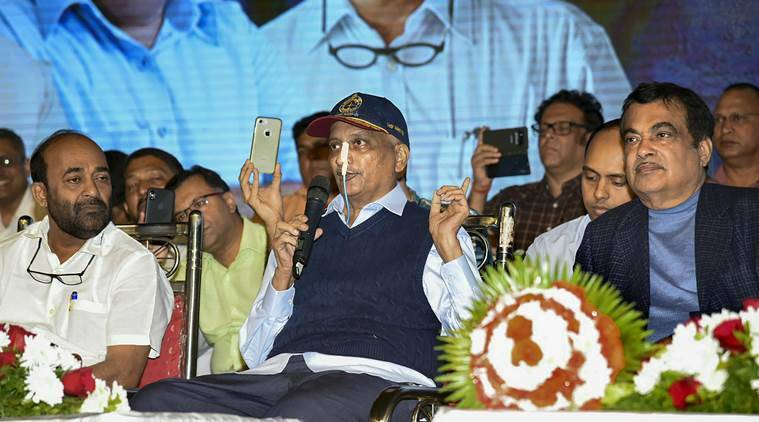 Tributes poured in from all quarters after President Ram Nath Kovind on Sunday announced that Goa Chief Minister and former defence minister Manohar Parrikar passed away after a year-long battle with pancreatic cancer. President Ram Nath Kovind’s condolence message, which was the first official confirmation about his death, described Parrikar as the “epitome of integrity and dedication in public life” while Prime Minister Narendra Modi said he was “an unparalleled leader, a true patriot and exceptional administrator." Goa Chief Minister Manohar Parrikar lost a yearlong battle with pancreatic cancer Sunday evening, breathing his last at his private residence in Dona Paula. Parrikar’s health worsened sharply Saturday, sending the BJP into a huddle, after which the party acknowledged that the “chances of his getting better are slim”. The late chief minister will be accorded a state funeral on Monday. 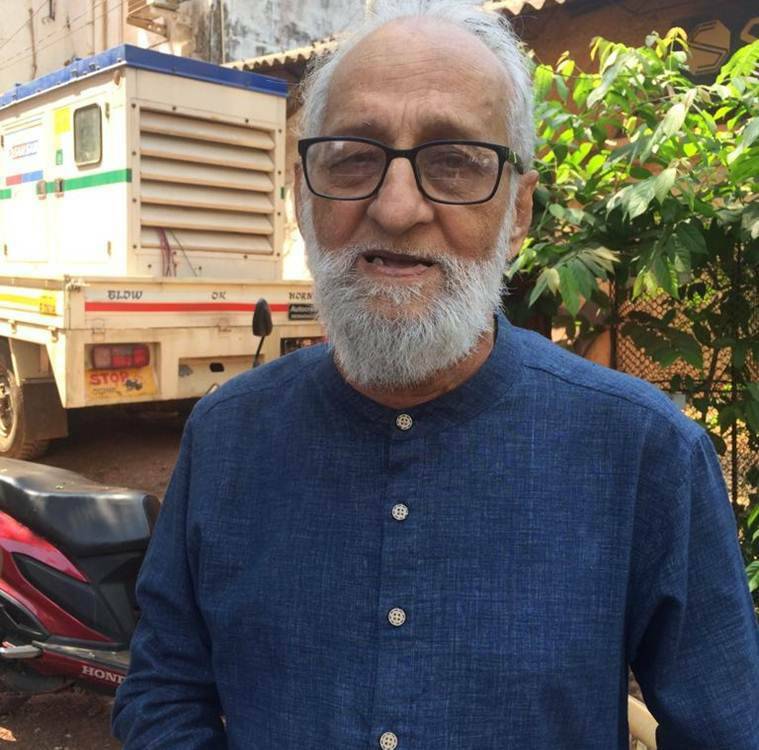 An official release from the CMO said his mortal remains will be kept at the BJP head office in Panaji for an hour from 9.30 am, after which they will be taken to Kala Academy for people to pay their last respects. The funeral procession to Miramar will start at 4 pm, and the Antim Kriya will be performed at 5 pm. The central government announced a day of national mourning on Monday. The national flag will fly at half mast in New Delhi and in the capitals of all states and Union Territories. The Union Cabinet will meet at 10 am on Monday to pay tribute to the leader. Goa announced seven days of mourning from Monday until March 24. After Parrikar's death, the BJP-led government's future is uncertain in Goa, In the Congress, there were apprehensions that the BJP might try to impose President’s Rule on the state. In the BJP camp, there was talk of Speaker Pramod Sawant as a possible “interim chief minister” till such time as the party was able to take stock of numbers and figure out strategy. With the demise of Manohar Parrikar, the strength of 40-member Goa Legislative Assembly has been reduced to 36. BJP MLA Francis D'Souza died last month, while two Congress members had resigned last year.